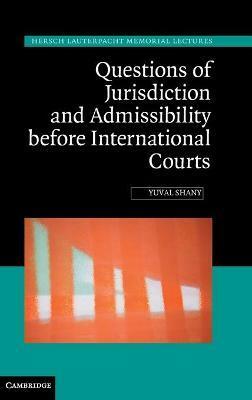 This examination of the jurisdiction of international courts and the admissibility of cases before them analyses jurisdictional and admissibility rules in light of the roles assumed by international courts in international life and in light of the roles that jurisdictional and admissibility rules play in promoting the effectiveness and legitimacy of international courts. The theory pursued views jurisdiction as a form of delegation of power (the power to exercise judicial power and decide the law) and regards admissibility as a framework for deciding upon the propriety of exercising such power. On the basis of this theoretical framework, the author critically evaluates the exercise of judicial discretion in the existing case law of a variety of international courts, distinguishing between the category-based case selection implicit in jurisdictional rules and the case-by-case analysis and selection implicit in rules on admissibility. Introduction; Part I. The Concept of Jurisdiction and Admissibility in International Adjudication: 1. Jurisdiction as a policy tool; 2. Jurisdiction as delegated authority; 3. Jurisdiction as a power constraint on international courts; 4. The role of admissibility in the exercise of judicial power; 5. The conflicting interests of international judges reviewing jurisdiction and admissibility; Part II. The Law Governing Jurisdictional Decisions of International Courts: 6. Jurisdiction in abstracto and in concreto; 7. Distinguishing jurisdiction from substantive law; 8. International court decisions on jurisdiction as a form of category-based case selection; 9. Individual case-by-case selection; Part III. Questions of Admissibility before International Courts: 10. The taxonomical challenge; 11. Admissibility as a policy tool; Conclusion. Yuval Shany is the Hersch Lauterpacht Chair in International Law in the Law Faculty at the Hebrew University of Jerusalem. He is also a member of the UN Human Rights Committee.